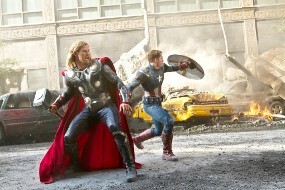 United States production of superhero films Marvel Studios 'The Avengers' will be released in 3D format. The director, Joss Whedon warrant such conversion will not disappoint the fans. On Thursday (22/12/2011) local time, Walt Disney Pictures announced that 'The Avengers' will also be released in 2D format. Regarding this, Joss Whedon was giving his comments. "There will be no 'Oh look, we'll spend 20 minutes to pass through this tunnel because of the 3D. And no one pointing at the screen all the time. But it's an action movie," said Joss as reported by Joblo, Friday (23/12/2011 ). Whedon added that he is one who is behind the idea to convert the film into 3D. The 47-year-old director was anxious to see into the movie that he was involved in it, and relate to it. "I'm not a big fan of the extreme length of the lens. I want to see the space that I'm involved in it, and is associated with it, so 3D is rather suitable aesthetically and technology has advanced so much in recent years," he explained.